I consider myself an active trader who holds on to very few companies for a very long time. Last year when I stumbled upon the 22nd Century Group (AMEX:XXII), I was surprised that I wanted to hold. Aside from the 250+ issued and pending patents revolving around the plant biotechnology in tobacco, cannabis, and hemp, the management team was the main factor. Needless to say, getting the opportunity to sit down with CEO Henry Sicignano was a fascinating hour of my life and I was able to gain further insight into exactly why this is one of the most undervalued, and under-the-radar growth plays available on the market today. Having grown the Natural American Spirit brand with Sante Fe Tobacco, both Henry and Michael Zercher, the Vice President of Global Business Development, surely know how to maneuver in this space. The old adage “been there and done that” rings true. The scientific team is stellar and considered industry leaders in their own rights. Michael R. Moynihan, Ph.D has over 25 years experience in plant biotechnology and Dr. Paul Rushton, Ph.D has over 30 years experience himself in the field. The responsible nature of the management team with shareholder value, increasing the stock price as a main focus, and overall experience of this team make this a company that I do not trade…I buy and hold. 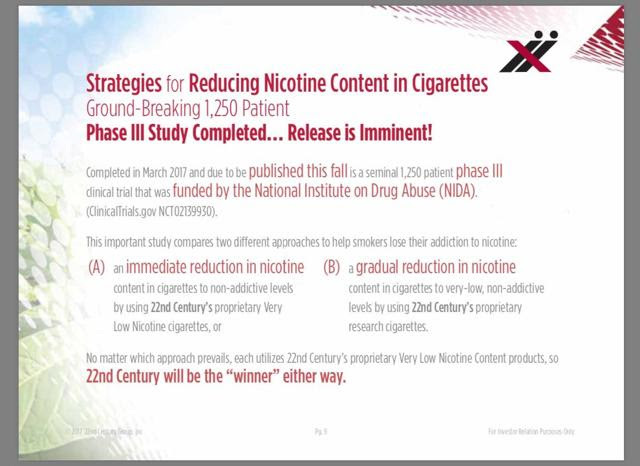 There has been so much spotlight on the XXII company and their very low nicotine (VLN) tobacco product recently since the FDA announced they are looking to mandate a low nicotine option for ALL cigarette manufacturers. The presser, if you haven’t already read, can be read here. I went ahead and did some more digging myself as I recalled reading an article with some unique insights into the matter. Sam Chambers wrote an article for Bloomberg News that you can find here. $10-12B annually. That is quite the large sum. Lets explore a hypothetical here. First, keep in mind this is JUST the European Union, and not anywhere else in the world. Secondly, this is assuming the technology to “strip” nicotine was readily available, which given the means today also strips the flavor and other aspects of the experience the user enjoys leaving behind an inferior product. Do we really think that any for profit company will eat that sort of cost in an attempt to stay compliant? Not a chance! We can safely assume that additional cost to produce the end product will result in a minimum $1.10 increase in the price per pack to the consumer. Compare this now inferior tasting and less effective product to the XXII Brand A. We can explore the boundaries of our imagination here for a moment and hypothesize that the Brand A product will be licensed out to all parties around the globe. Even if the XXII team were to get a small .10 royalty per pack that represents a 90% savings to the tobacco groups, and a would generate somewhere in the ballpark of $1.1-1.2B annually with NO associated cost. Given just that scenario alone and todays current MC of 233.3M it would translate into a 10.00 increase in price roughly landing the ticker in the 12.00 range. To note: none of the above scenario takes into consideration the fact that XXII already does, and will only continue to sell more and more of their own product. For the sake of low balling to remain conservative, lets factor in a .25% taking of the market. Just 1/4 of a point would reflect a $1B increase in MC adding an additional 10.00 to the stock price. Now think about just a 1% taking of the market which is not out of the realm of possible by any stretch of the imagination and we are talking and insane amount of growth potential in a short period of time. HINT HINT? In my previous article titled “22nd Century Group: Big Trouble For Big Tobacco – How The Big Are Falling Behind”, which can be read here, I noted the World Health Organization’s push for all member countries to carry a low nicotine option, and New Zealand’s own push to completely eliminate smoking completely by 2020. Another item of note from the FDA in the recent months is the move to regulate the levels of NNN, which is a natural carcinogen found in the plant. The move against the regulation in smokeless tobacco created quite an uproar for a lot of the larger tobacco groups. Here is the official response to the FDA from Altria. In it they are quoted as saying it is not possible to achieve the levels required. With the knowledge we as investors have from the scientific data put out in peer reviews and journals, we can safely argue that the XXII technology reduces NNN levels to that of the proposed regulation levels. Yes. The answer is yes. 22nd Century can control the levels. 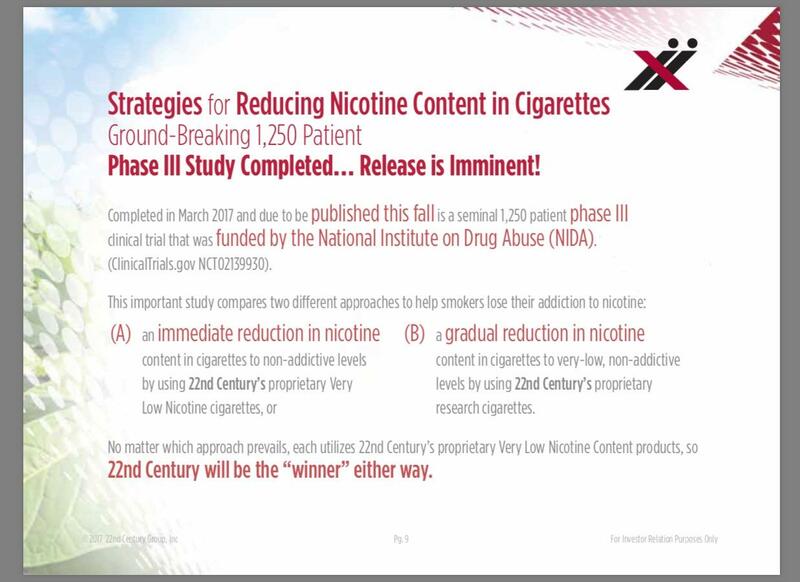 Lastly on the tobacco front it is worth mentioning that the 1,250 patient study funded by the National Institute on Drug Abuse (NIDA), was completed in March 2017 and is due to be published this Fall. Henry, when asked about this further only said, “It is rather convenient that the FDA has the data, and choses now to really begin pushing the narrative of reducing nicotine levels across the board.” When I asked him to further elaborate he only said, “I’ll remind everyone we are the only company in the world able to do this”, and declined to further comment. When you’ve done all the reading and all the research you can into various topics that the XXII team touches on it isn’t far fetched to draw some conclusions. The FDA has already endorsed the company, all regulatory bodies are in agreement on the direction the world will go in regards to tobacco, nicotine, and other carcinogens found in the products. The next slide is an additional near term catalyst that many are not aware of or waiting on. The FDA has already reviewed the data, has this study in peer review and commenting period, has already made comments regarding on the direction they want to go, and any day the results will be published for all to enjoy. At the end of the day the tobacco technology creates a highly differentiated premium brand that provides the users the ability to enjoy smoking because they want to….not because they need to. It is in this arena that I feel the most undervalued portion of this company lies. Aside from what they do with the tobacco plant, the XXII team has put their technology to good use in the cannabis world. Yes! They have created a 0 THC cannabis and hemp strain! The world rejoices. At least the segment of population who partakes does! This has many factors that need to be examined in depth for anyone to truly understand the meaning of what we have in front of us. 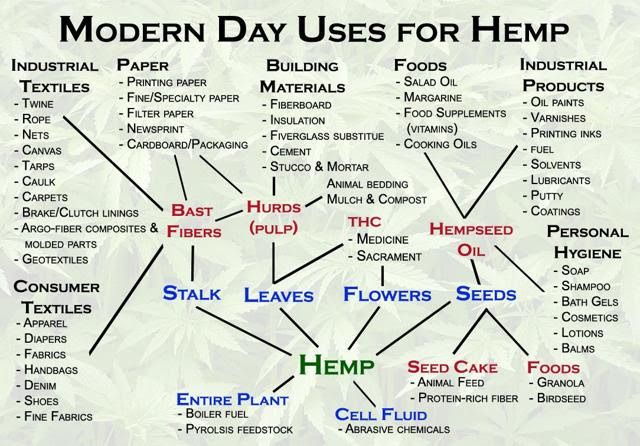 To put it short, you use the hemp plant itself to clean the soil and air as it grows. There are actually a couple of different ways in which this is done. The first being what we described, and has been used throughout history to clean up toxic spills and accidents like those of Churnobyl and more recently at the Fukushima nuclear plant. The second way actually takes the end product of the plant after it’s oils have been processed out of them, and grinds the stalk into a fine powder. This powder is spread out over the land wherever the earth has been contaminated. After a couple of weeks it is essentially raked up and the top layer of soil removed and magically there is no more contamination! Even whole countries like China have adopted deforestation policies and have begun planting hemp to clean the air and soil. What this means for the legal hemp and cannabis industries is limitless. With the XXII patented technology essentially all risk is being removed from the industry. When a strain can be made to become stable for each environment and micro climate it can be grown, as well as being GUARANTEED to be under the legal limit of THC, you have ensured that every crop will be profitable. That is priceless for an industry constantly in price wars which ultimately drive the prices, and profitability, down. As the medical and recreational cannabis industry continue to emerge and regulations set the XXII technology will play a vital role in ensuring all levels are met. For those who are unaware of the depths people go to in the cannabis world to create new and unique strains here is a quick beginners guide to the process. Briefly put, you take a male of one type, the female of another and pollinate. You then take the offspring of that one and test it many different times before selecting which next strain you may wish to cross it with. Select the best result of that batch and the process goes on and on, for years and even decades. With the XXII technology in the space, they are able to take anyones favorite strain and create the proper levels needed to ensure legality and maximum health benefits. All in a NON-GMO way and all done in MONTHS. For the research and medical communities this is yet another priceless item to notch on the bedpost of XXII. When a researcher wants to explore what this specific cannabinoid does in elevated levels they can contract with the 22nd Century Group and receive their specimens. The company has several applications submitted for special permits to increase the cannabis, hemp, and tobacco growing items. In fact, Henry mentioned in our conversations that the team is currently in the process of brining in (7) new researchers in this field to help satisfy the need. One can only guess the meetings behind closed doors! You know that I couldn’t spend an hour talking to the CEO of a company without attempting to poke and prod any juicy tidbit of info. If anyone has listened to Henry on a conference call you know he does not play games, is very passionate, and gets straight to the point. I was pleasantly surprised when he replied with, “We are in active discussions with numerous strategic partners both in the form of companies and institutions in the US and abroad.” I got him to budge! This is one company I am hard pressed to find any ill things to say about which frankly terrifies me. Alas, this is why I have come to learn that you hold this stock. Traders are always near and dear to my heart, but this is one all should have a core position in. That said, the normal warnings apply with any stock at this price. Easy manipulation can occur from outside forces trying to keep prices lower why they load up shares on the back end. How’s that for you conspiracy theorists! What will happen if the FDA comes back and says no altogether on the MRTP application? There are a lot of long term investors who are holding for that alone and that of course would have a significant affect on the stock price. Also, the length of time of holding is something that should be mentioned. True enough that come tomorrow morning this company can be partnered, sold, pushed up 10-20x on news from the FDA, it also runs the risk of being at the mercy of traders and profit takers for years to come. Given the companies current MC (at the time of writing this article) is roughly 233M. We can round up, since while writing this the ticker is actually on a rampage upwards, and say 250M MC. Throughout the article we have shown numerous examples, in many different billion dollar industries, on exactly how XXII won’t just be the best option, but the only. That fact is not deniable with the patents in place and need of these industries. Shall we take a conservative multiplier and figure that with each successful step along this journey the company increases 10.00 a share. The most easily attained, and most conservative, figures coming from the hemp and VLN products put this squarely as a 22.50 stock. Now imagine if just 1% of the total possible best case scenario is achieved, which again is entirely possibly given all of the points laid out through the article, this stock becomes a 40.00 ticker over the course of a couple of years. There is such a low exposure rate to this company with only (roughly) 10% owned by institutions that it is laughable. The volume each day is majority retail investors moving in, and the traders passing shares around. Henry was noted in our talks as saying that they receive daily phone calls, and are well aware of the fact that institutions are indeed buying in through the open market. I for one can’t wait to see what begins to happen with the price as the 85M share float is gobbled up and more and more shares are taken out of circulation. At this point in time there is no risk of dilution, even though there is a $100M shelf that is available for them to tap into, as the company has enough cash on hand to fund themselves in all aspects of the business until early to mid 2019. More on their recent financials and earnings statement can be found in that link. See what I did there? Wrap…tobacco…nevermind! I’ve stated before, I’m a trader. I don’t get comfortable holding onto too many stocks but when I found this company this is one that I, admittedly do have a swing account that I trade on, but I continue to buy buy buy and add to my long position. The company is growing. They are literally growing their numbers in front of our eyes with new research deals, new global deals…the list of new goes on and will continue to do so for the foreseeable future. Between the FDA mandates, WHO mandates, Tobacco, Hemp, and Cannabis, the strategic partnerships, potential acquisitions, current and future deals with researchers, interest from institutions and other large investors….the growth potential is unbelievable. “I have never sold a share of stock…ever. And quite frankly my friends and family haven’t either.” – Henry Sicignano, CEO 22nd Century Group, Inc.
DISCLAIMER: I/We wrote this article myself/ourself. I/We have received no compensation from the named companies. I am / We Are LONG XXII. Thanks for the questions. The FDA is required to set the standards, which they are in the process of doing with the reduced nicotine and NNN level push they have engaged with over the past year. XXII products are used in the testing, the WHO supports the initiatives and wants even more stringent regulations around the world and all minimums are exceeded by the 22nd technology. The minimums were set by studying XXII’s products in fact.